OK, this is strange. I started writing with episode 3, and I had to wait for the reruns of episodes 1 and 2 before I could videotape them and subsequently create these stupendously entertaining reviews. So I'm writing this after the season has ended, and I've gone from ranting about good fights between champions in episode 10 back to being horrified by also-rans here in episode 1. If you're new, and you care, you can temporarily visit episode 8, where I go into some detail about my arbitrary bot gender scheme. It will explain why some bots all of a sudden go all female. We're starting off with Deathstar vs. Phrizbee. Deathstar is a metal box with what looks like a sander attached to each corner, except that the sanding discs have been replaced with circular cutting blades. Each sander is attached to its neighbor with a large spring. It's been a while, but I think Deathstar probably resembles the ship from Space 1999. Phrizbee is a black spinbot that looks exactly like a brobdignanian hockey puck. OK, Robot Fighting Time. Deathstar comes straight over to Phrizbee, who has not yet left the blue square. It looks like Phrizbee was trying to spin up to speed. Deathstar and Phrizbee collide but nothing happens because Phrizbee isn't up to speed yet, and Deathstar just is too lame to do any damage. We get some slow motoring around the box, then Phrizbee starts to spin again. Deathstar gets over to her before she's full speed, and we get a replay of the last non-hit that we just experienced. OK, Deathstar is putting a number of hits on Phrizbee with one of the springs, which, to tell the truth, is really just not causing very much damage. I guess the spring is supposed to cause the two sanders to close in on Phrizbee, but they're not closing in far enough, and even if they smashed into the side of Phrizbee, the circular blades aren't moving, and this "active armor" appears to have the activity of a dead hermit crab. Deathstar surfs the killsaws, and smashes into Phrizbee with one of the springs. Ping! That saw hit appears to have cut at least one of the other springs. It looks like Deathstar has suddenly put her head on a bat and spun around because we have her lurching randomly, and then slowly staggering off in a beeline for the pulverizer, while Phrizbee watches paint dry on the other side of the battlebox. Pow! Oh there's smoke in the Deathstar camp, looks like one of the sanders is in the process of self-destruction. Deathstar now staggers backwards from the pulverizer, then throws it in drive and revisits the yellow spot. Pow! Pow! OK, while Phrizbee was watching the paint, she conveniently spun to speed. She now re-enters the battle scene and immediately works on deconstructing one of the sanders. She accomplishes this task in two hits. Deathstar drags herself slowly away, leaving an enormous trail of smoke. Phrizbee takes a running start and Whap! Deathstar parts rain from the sky. Phrizbee takes another running start and Whap! We've got a fountain of Deathstar parts. Deathstar is now crawling on her last legs, and Phrizbee starts back for another hit. Whap! And another. Whap! Explosion of small Deathstar parts. OK. Now we've got Deathstar dragging her carcass across the floor, with parts hanging off all broken, oh this is ugly. Now Phrizbee has spun down to pushbot status and pushes the Deathstar remains upder the hammer. Pow! Pow! Pow! We've got a couple feeble attempts by Deathstar to remove herself from this predicament, but I think this one's Game Over folks. 37-8 decision for Phrizbee. Ravager is a textured metal box with a really skinny lifting arm that looks like the builders created it out of parts found in your garden variety erector set. There's a name for the kind of texture on the box, it's the same texture depicted in the background of my battlebot episode index page. T-Minus is a compact box with big wheels and a whomper lifting arm. The wheels seem to change color depending on who is doing the bot introductions. If Bil and Tim introduce T-Minus, the wheels are black. If Mark Biero does it, they're red. We all want T-Minus to get inverted, because he re-inverts himself by performing his trademark 540 flip. OK, RFT. Both bots leave their squares and engage in a fairly mediocre hit. While Ravager is running around with his lifting arm in the upright position, T-Minus smashes into the front of him and activates his own arm, moving a lot of air around in the process. Ravager parks himself directly on top of the killsaws for a staggering amount of time, and Pete shows what a nice guy he can be by waiting a full 5 seconds before he activates them. T-Minus tries to come in for a quick smash-n-lift, and immediately inverts himself. Goody, goody, here comes the 540....ooooh, that was more like a 570, but it doesn't matter, he's back on his feet. We have another head-on collision, during which both bots uselessly activate their arms. Ravager tries to get a flip on T-Minus with his slow action arm, and succeeds on the second try. T-Minus performs a perfect 540, with Ravager driving underneath him while he's airborne. Neat. Now we have T-Minus trying to get his lifting arm under the side of Ravager but there's nothing doing here, Ravager has some well designed skirts on his back and sides. The front is a different story. There's no skirt, and even with my poor vision, I can see that there's a T-Minus lifting arm sized gap between the bottom of Ravager and the battlebox floor. I'm not a bot builder, and I don't even play one on TV, but this looks like a major design flaw. Guess what. We've now got T-Minus poking at the front of Ravager, and we've got T-Minus' lifting arm in the T-Minus lifting arm sized slot underneath Ravager, and we've got Ravager doing a triple back somersault, and Smash! we've got Ravager landing hard on his side. Ouch. Ravager retracts his arm in an attempt to re-invert himself, and ends up flat on his back. Now we've got Ravager upside down doing push-ups with his lifting arm, and I'm starting to smell Game Over. We've got a Pete's-eye view of the hapless Ravager, and then we've got instantaneous transportation of T-Minus back to the blue square for the victory spin. Fantom Thrust appears to be a metal bot with a big metal pneumatic spike between two big metal treads. Since killsaws seem to be unerringly drawn to treads, we'll refer to treads as killsaw magnets from here on in. The commentators tell me there's a variable pitch metal wedge as well. The Probe is a low metal box with a large triple pronged lifting arm. OK, RFT. We've got a bit of robot avoidance and then The Probe gets the lifting arm under Fantom Thrust. Fantom Thrust slips right off as The Probe tries the lift. The Probe now goes over to the corner of the box to play with his lifting arm. Fantom Thrust eventually makes his way over and starts pushing The Probe around. I guess Fantom Thrust can't see where he's going or something because he pushes The Probe toward the killsaws, and then continues pushing until The Probe has cleared the saw area. This pushing action puts Fantom Thrust directly on top of the saws. Let me rephrase that. This puts Fantom Thrust's big metal treads directly in the path of the killsaws should Pete feel the need to activate them. Pete feels the need to activate the saws. Fantom Thrust feels the pain of a completely shredded tread. Why do people put treads on bots?! Now The Probe takes a minor killsaw hit, but I say it's probably safe to bet your retirement savings on him to win this fight. Now The Probe tries once again to lift up the hugely immobile Fantom Thrust, and somehow gets one of his prongs stuck in that variable pitch wedge. Now we've got The Probe with the lifting arm up, carrying his stuck prize to the hammer corner. Fantom Thrust starts activating the pnematic spike into the air, and I'll leave it at that. Now we have Bil reminding us that the bots can only be stuck for 30 seconds. Looks like a moot point though, because The Probe has managed to break off the variable pitch wedge, separating the bots. The Probe lifts his arm over his head, displaying the torn wedge for all who care to see. Refs count out Fantom Thrust. Game Over. Scrap Daddy's Surplus is two wheels and a long arm with a ball and chain at the end. Wedge of Doom is Hazard's younger brother. He's a very low metal wedge with little metal wheels and a lifting arm. OK RFT. Scrap Daddy's Surplus is trying to spin around and hit Wedge of Doom with the ball and chain. Wedge of Doom is motoring all around, getting under Scrap Daddy's Surplus' wheels and generally making a nuisance out of himself. Wedge of Doom is FAST. Scrap Daddy's Surplus kind of has a small problem with the saws, then manages to spin around and get in some good metal ball thwacks on Wedge of Doom. The announcers make sure to tell us that the Scrap Daddy folks have entered all sorts of bots in all weight divisions over the years, none of which has done very well. Looks like this could be the exception since Scrap Daddy's Surplus seems to be holding his own with Wedge of Doom. Now we've got Wedge of Doom pushing Scrap Daddy's Surplus under the pulverizer. Pow! Shortly after that, Wedge of Doom stuffs Scrap Daddy's Surplus into the spikes. Scrap Daddy's Surplus gets his act together and lands a good number of thwacks on Wedge of Doom with that ball and chain. 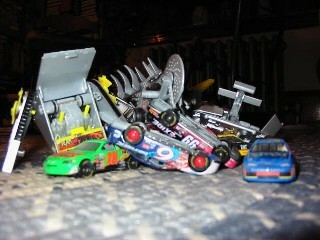 Wedge of Doom continues to ram into Scrap Daddy's Surplus and get under his wheels. This goes on for a little while and then the chain gets all tangled up in Wedge of Doom. Scrap Daddy's Surplus immediately heads for the pulverizer and Pow! we've got a direct hit on Wedge of Doom. Ooh, that hadda hurt. Scrap Daddy's Surplus deposits Wedge of Doom on the spikes. Wedge of Doom throws it into reverse and travels along the spike strip until he gets to the part where it angles off. He smashes into the angled strip and knocks himself off of the spikes. Impressive. Now we've got Scrap Daddy's Surplus all with the ball and chain again, and Wedge of Doom all with the wedge. All of a sudden Wedge of Doom has his arm stuck in the upright position. I think he was trying to push Scrap Daddy's Surplus or something. If we're in a pushing match though, Scrap Daddy's Surplus seems to always come out ahead, and here we go! Wedge of Doom gets pushed right to the yellow spot, and we've got massive hits on Wedge of Doom as time runs out. I personally think that this could go either way. Judges decision: 24-21 for Wedge of Doom. Now we've got what appears to be the same stock footage of booing and thumbs down that we get everytime there's a fight that could have easily gone the other way. Vladiator is a flattish box with a kind of wedge and a big ol' spike sticking out the front. Trimangle is a long flat box with a spinning triangular blade. The blade is mounted at an angle on the front of the bot, forming a wedge. OK, RFT. The bots approach each other, make a minor thud, and drive away. We watch an imminent train wreck as Trimangle slowly travels towards Vladiator, taking a path directly across the killsaws. Holy Blindness, Batman! The most amazing explosion of blinding white sparks I have ever seen on battlebots spews from Trimangle's bottom. Whoa. I need to rewind and watch that again. Whoa. OK, we've now got Vladiator trying to get under Trimangle with the spike as Trimangle backs up over the saws again. More sparks. Now we've got Vladiator up on the back of Trimangle, approaching the spinning blade from the back. Swoosh! The blade takes Vladiator's spike right off! I'm going to once again avoid the obvious comment. Gage looks very concerned. Now we've got Vladiator tearing around the box, putting major hits on the front of Trimangle. Eventually, Trimangle's blade stops spinning. Now we've got Vladiator taking a running start and launching himself into the air over the back of Trimangle. Nice. Trimangle seems to be courting the killsaws as we've got more sparks. Ooh. Looks like Trimangle has a minor case of nasty wheel. He better watch out, that could spread. We've now got Trimangle moving back and forth across the box in a straight line, probably because there's nothing else he can do at this point. Now he's hung up on the saws again, and the nasty wheel is spreading. The crippled Trimangle suffers as Vladiator takes a running start and uses the now bent and useless spinning blade as a launching pad. Wheeee! We've get a close up of Trimangle that allows us to see that the entire bot has been taken over by nasty wheel. Vladiator smashes into the back of Trimangle and then somehow ends up completely on top of him. Time runs out while we're still all piggyback. So now we get an astounding series of commercials. During the first run of the season, I could swear that the only commercials were for Taco Bell, 3-D's, and Xbox. Junk food and video games and Breastwatch babes. Traditional nerdy teenage male things. Now that they're in the reruns, I could swear that other advertisers are creeping in. Like Buick cars. So I'm watching, sort of half paying attention when this Bailey's commercial comes on. This isn't wine or beer, this is liquor! Heavy stuff for a sport that is supposedly "for the kids". Then we get an Intel commercial, and then something truly horrifying, a commercial for ENZYTE, a "natural male enhancement"! I can just see all the little kids asking their Dad what a "natural male enhancement" is. Bwaaa-ha-ha! One thing I know for sure is that you'll NEVER see a commercial for age-defying face cream run during battlebots. Or frozen convenience foods. Or laundry detergent. Or any other product specifically marketed towards the traditional 18-62 female demographic. Killer B is a yellow wedge with black chevrons. Shark Byte is a cylindrical bot with a spinner that looks like a giant Cuisinart blade. There's a shark jaw mounted on top of it. OK, RFT. Shark Byte quickly spins up to speed as Killer B screams out of the blue square and heads full speed straight towards him. Shark Byte nonchalantly moves out of the way and Killer B flies directly into the screw. Oooooof. OK, now we've got Killer B with the wedge under Shark Byte, pushing Shark Byte into the wall. Shark Byte juliennes the wall in approximately 0.75 sec. I thought there were rules against weapons that can destroy the battlebox. Killer B stuffs Shark Byte into the wall again, causing the shark jaw to become majorly unmounted. Alright, we've got the wedge under Shark Byte again, and Shark Byte completely on the back of Killer B. Killer B heads straight for the hammer, but he's going too fast and crashes into the wall, sending Shark Byte flying. Now we've got Killer B smushing Shark Byte into the spikes. Shark Byte ends up on the back of Killer B again and Killer B smashing head on into the screw casing. We're all push city here, with Killer B pushing Shark Byte under the hammer and Killer B pushing Shark Byte across the battlebox at a high rate of speed, and Shark Byte smashing into the spikes at a high rate of speed. Oooooof. OK, now we've got Shark Byte terminally on top of Killer B, and this time Killer B carefully positions Shark Byte under the hammer. Pow! Pow! Pow! We've got massive hammer hits to Shark Byte while he is positioned on top of Killer B. I'm amazed that Shark Byte's blade continues to spin through all this abuse. Shark Byte finally gets out of this non-optimal situation and motors away. Killer B sits. And sits. And sits. It appears that the hammer blows went right through Shark Byte, and damaged Killer B! Now that is true, unadulterated pain. Even I feel the pain. Oh, that's painful. Shark Byte pushes Killer B over to the yellow spot just because he can, and we get continual pulverizer hits to Killer B as we have the countout. Game Over. Ugly shot of diced lexan wall. Ziggo is an upside-down wok on wheels that spins very fast. There is a bent metal pole that sticks out of the top of the wok to show Jonathan Ridder which way the wheels are facing. Ziggo is one of the most unstable bots in this entire competition. SnowFlake is a small red box with two wheels on the back and a mini snow plow on the front. OK, RFT. SnowFlake comes out of the blue box, and it looks like he's come down with ergot poisoning because he's driving all around at random, totally not heading toward Ziggo. You have to wonder where he thinks he is, maybe the Bahamas or something. So now we have Ziggo, totally not being affected by SnowFlake at all, spun completely up to speed. So now we have Ziggo, totally not being affected by SnowFlake at all, going all off balance, and almost completely losing it before finally getting back under control. We get a comment about "pulling a Mauler" from the announcers. Perhaps they're refering to the Mauler 5150 debacle in episode 8. Returning to our fight, SnowFlake continues to snorkel in the Caribbean, and then finally catches a flight back to this universe and puts a hit on Ziggo with his wheel. SnowFlake gets so excited about making contact with his opponent that he immediately drives directly into the screw. Oof. Now it looks like the ergot is back, and SnowFlake is mistaking Ziggo for a Mexican hat and doing the Mexican hat dance. While SnowFlake is busy dancing around, Ziggo drives herself over the saws. SnowFlake shakes the ergot long enough to finally put a hit on Ziggo again. Ziggo appears to be unharmed. Now SnowFlake seems to have dissociated from his body, leaving the body sitting motionless in the middle of the floor. Ziggo hits SnowFlake and pushes him onto the saws. The saws pop and toss SnowFlake like a rag doll. Now we've got Ziggo surveying the situation, and giving SnowFlake a minor hit, just to make sure he's dead. Countout. We get to four, and then SnowFlake comes zooming back down into his body, probably because he forgot to take something with him the last time. SnowFlake putters around a bit, then runs head on into Ziggo. SnowFlake now appears to have found whatever it is that he forgot and split the scene again because it looks like we're all permanently dissociated. We've got the girl driver of SnowFlake screaming "hit me", but like I said, the situation appears permanent. Further hits do nothing but bend some metal and toss what's left of SnowFlake onto the killsaws. Game Over.